Three years ago, on April 24, 2007, shortly after being diagnosed with type 1 diabetes, Caleb started pumping insulin. I remember this date as much as I remember his birthday. There were lots of smiles and celebration. It was a huge relief. It meant more freedom to eat, drink and be merry. It meant less shots and less pain. It meant me not having to put on a performance pretending that three 50 carb meals and three 20 carb snacks, precisely timed, included exactly what Caleb wanted to satisfy his appetite every day. Since then, Caleb has used more than 450 Pods, has pumped more than 15,000 units of insulin and consumed more than 220,000 carbohydrates. He’s also eaten pizza, devoured cupcakes, dined on Chinese food, eaten off-schedule, partaken in indulgent Thanksgiving feasts, and enjoyed goodies from his trick-or-treat bag. Don’t get me wrong – there’s a lot of healthy eating in between that would make Jamie Oliver proud, but those of you who understand diabetes appreciate how difficult eating pizza and carb-filled cupcakes can be. Pumping makes it easier for Caleb, if not just simply possible. As demanding as managing type 1 diabetes is, I think often of what it was. I am thankful that Caleb has a pump available to him to make it less limiting than just 10 or 20 years ago. Caleb pumps with the OmniPod. That choice was an easy one for us. 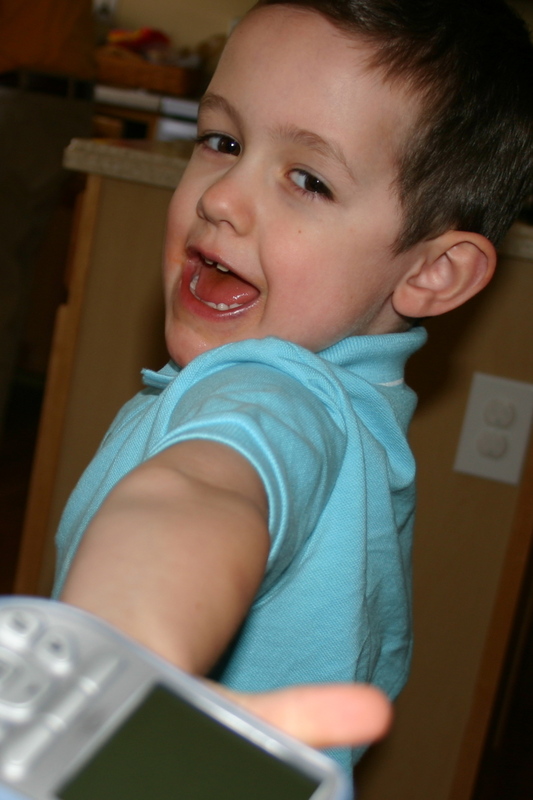 Since the day he started pumping, at just 4 years old, he was able to deliver his own bolus’. 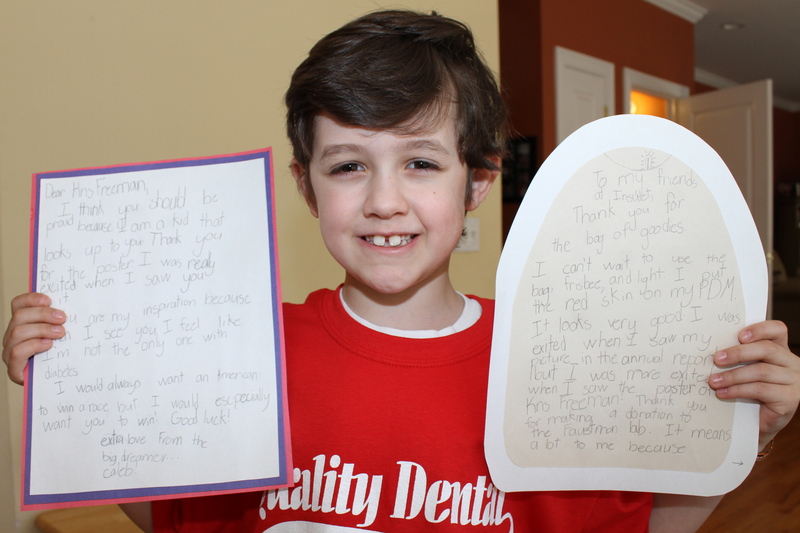 He, himself has delivered each dose of insulin while at school, including preschool. From the beginning, he has helped change his Pod and just recently, at the age of seven, he has started doing Pod changes completely by himself. 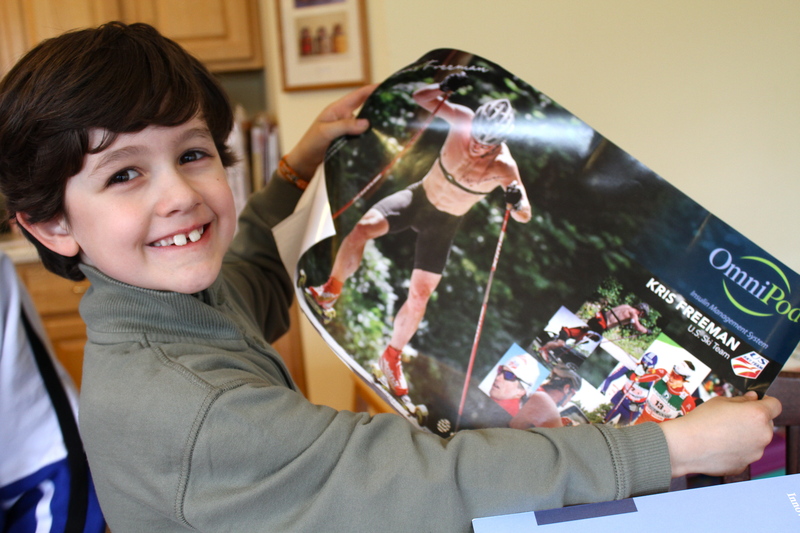 In appreciation of allowing a photo of Caleb to be included in their 2009 annual report, Insulet has made a donation of $500 in Caleb’s name to the Faustman Labs at Massachussettes General Hospital. Dr. Denise Faustman and her team are doing such important work to find a cure for type 1 diabetes and I’m thrilled that Insulet has supported them. Caleb also received an autographed poster of Kris Freeman with the inscription, “Dream big, Caleb!” As you can see, he was over the moon about it. I think you should be proud because I am a kid that looks up to you. Thank you for the poster. I was really excited when I saw you on it. You are my inspiration because when I see you, I feel like I’m not the only one with diabetes. I would always want an American to win a race, but I would escpecially want you to win! Good luck! Thank you to all the pump manufacturers for making devices that make life with diabetes a little better for so many. Please keep working to make improvements. As great as pumps are, they are but crude replacements for a functioning human pancreas, and people who live with this every day deserve better. 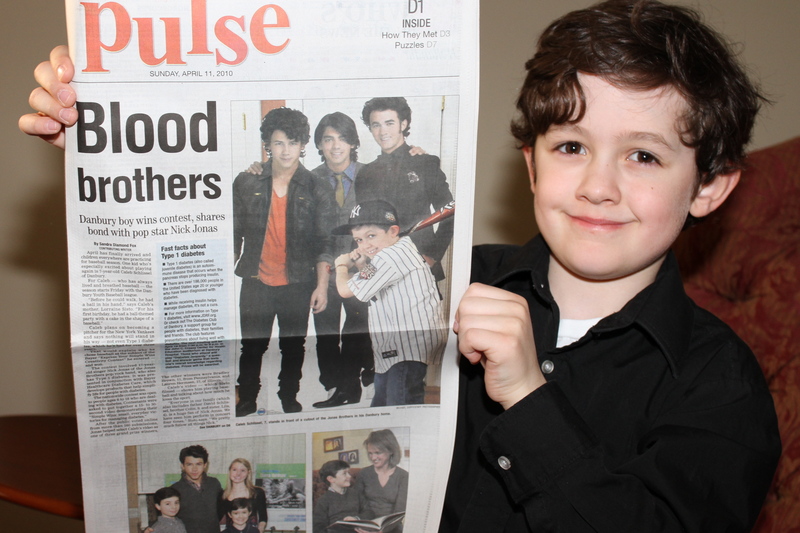 The Danbury News-Times featured a story about Caleb, his love of baseball and his meeting with Nick Jonas. Thank you Brian for contacting us and Sandi for doing such a great job on the story! If you missed it, here’s my write-up of when Caleb and Nick met. April has finally arrived and children everywhere are practicing for baseball season, which begins later this month. One kid who’s especially excited about playing again is 7-year-old Caleb Schlissel of Danbury. For Caleb — who has always lived and breathed baseball — the season starts Friday with the Danbury Youth Baseball league. Caleb plans on becoming a pitcher for the New York Yankees and says nothing will stand in his way — not even Type 1 diabetes, which he’s had for over three years. That would explain why he chose baseball as the subject of the Bayer “Express Your Simple Wins Creativity Contest” he entered — and won. The contest involved 17-year-old singer Nick Jonas of the Jonas Brothers pop/rock band, who also has Type 1 diabetes. It was presented in conjunction with Bayer Healthcare Diabetes Care, which develops products that help simplify life for people with diabetes. After the public voted online from more than 160 submissions, Jonas helped select Caleb’s video as one of three grand prize winners. The other winners were Bradley Brown, 11, from Pennsylvania, and Lauren Hermsen, 17, of Illinois. Caleb’s video — which Sisto filmed — shows him playing baseball and talking about how much he loves the sport. As one of the grand prize winners, Bayer HealthCare flew Caleb and his mother to Disney’s Grand Floridian Resort & Spa in Florida for a meet and greet with Nick Jonas and the other winners. Jonas spoke to Caleb about his passion for baseball, and about living with diabetes. “Nick was very warm and very caring, and really focused on Caleb,” she adds of the meeting, which occurred in December. “At the end of the event, they both pulled up their shirts to show each other their `pods,’ the OmniPod Insulin Management System, which supplies their bodies with insulin,” she says. 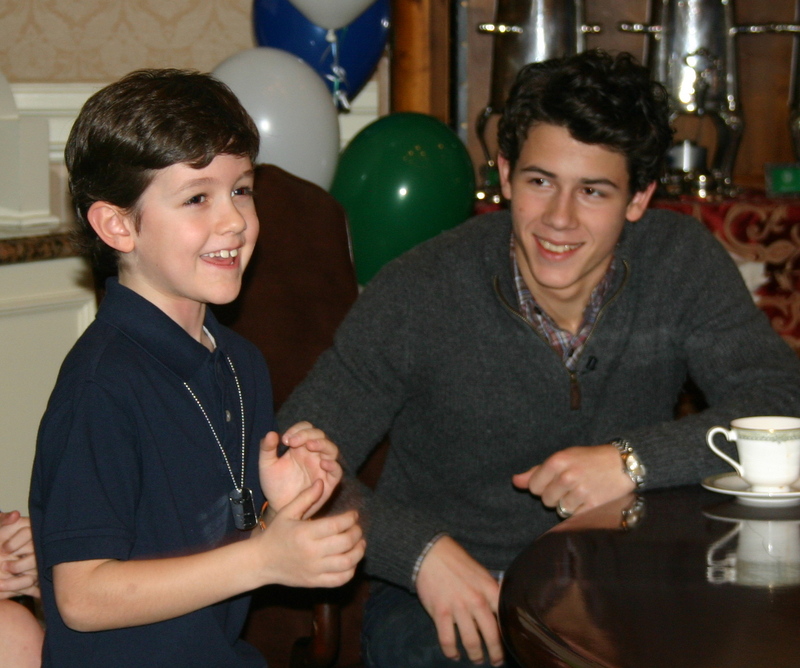 “I really liked meeting Nick because he has Type 1 diabetes like me. When I talked to him, I didn’t feel like I’m the only one with diabetes,” says Caleb, who is a first-grader at King Street Primary School in Danbury. “It was very inspiring and encouraging to see a young person who is dealing with this and not letting it stop him from doing what he wants to do,” Sisto says. Sisto spoke with Nick Jonas’ father, Paul Jonas (who goes by the name Kevin), who was also at the event. He told her his son is happy to be a role model for other kids with Type 1 diabetes. “He said that when Nick was diagnosed, Nick didn’t have anyone to look up to who had the condition. Nick wants to be to other kids what he didn’t have for himself,” she says. “This contest was put in place to help inspire kids with diabetes to express and share their simple wins,” says Judy Manning, director of consumer marketing for Bayer HealthCare Diabetes Care, located in Tarrytown, N.Y.
“Life alone for anyone is complicated, but it’s much more so for people living with diabetes. Between (the nuisance of) having to prick their finger to measure their blood sugar many times a day, and the social issues involved with caring for this disease in school and with friends, anything we can do to make it easier for them is important,” Manning says. 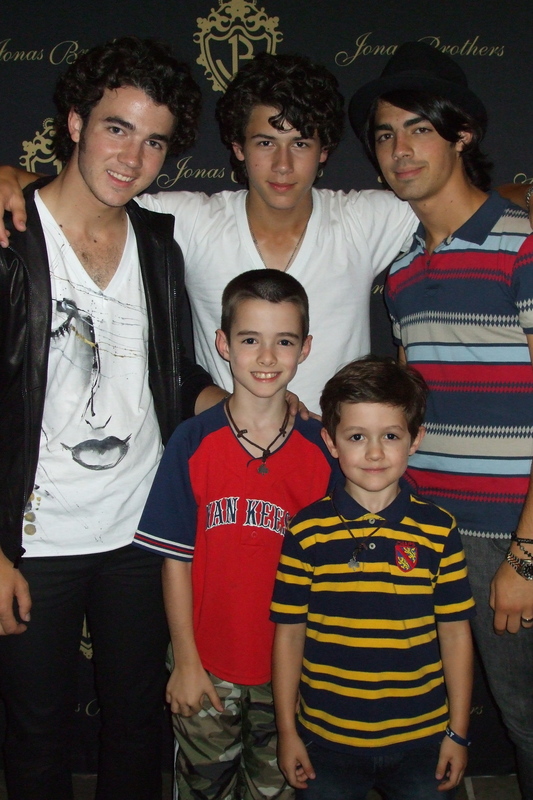 As a grand prize winner, Caleb also received a glucose meter, a Jonas Nintendo DS game, a CD of Nick Jonas’ song “A Little Bit Longer” about living with diabetes; and an autographed copy of “Burning Up: On Tour with the Jonas Brothers,” a book written by all three Jonas brothers — Joe, Kevin and Nick. This is the second contest Bayer Healthcare Diabetes Care held that involved Nick Jonas, who was diagnosed with diabetes when he was 13. In 2008, the company held a “Walk in Nick’s Shoes” sweepstakes. Winners got to meet Nick at the Juvenile Diabetes Walk in Los Angeles, Calif. Since learning about Nick Jonas, Caleb’s parents have become aware of other people in the public eye who share their son’s condition. 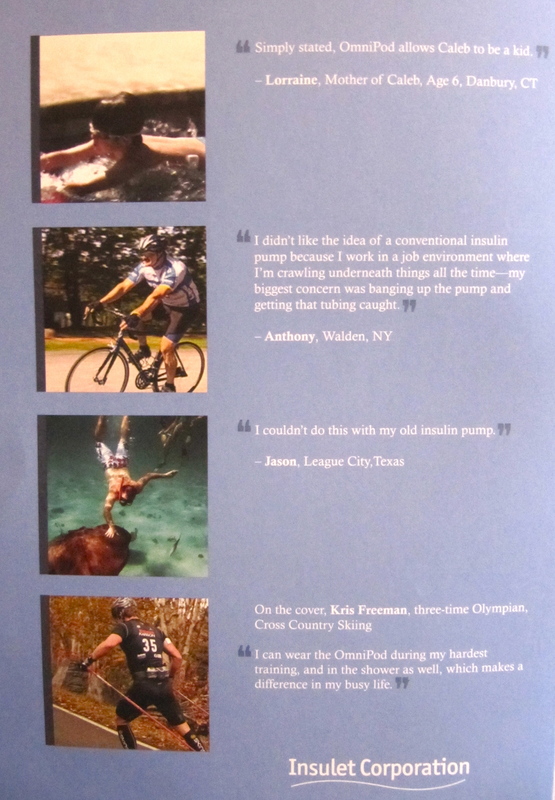 Two of them include competitive cross-country skier Kris Freeman and Chicago Bears quarterback Jay Cutler. 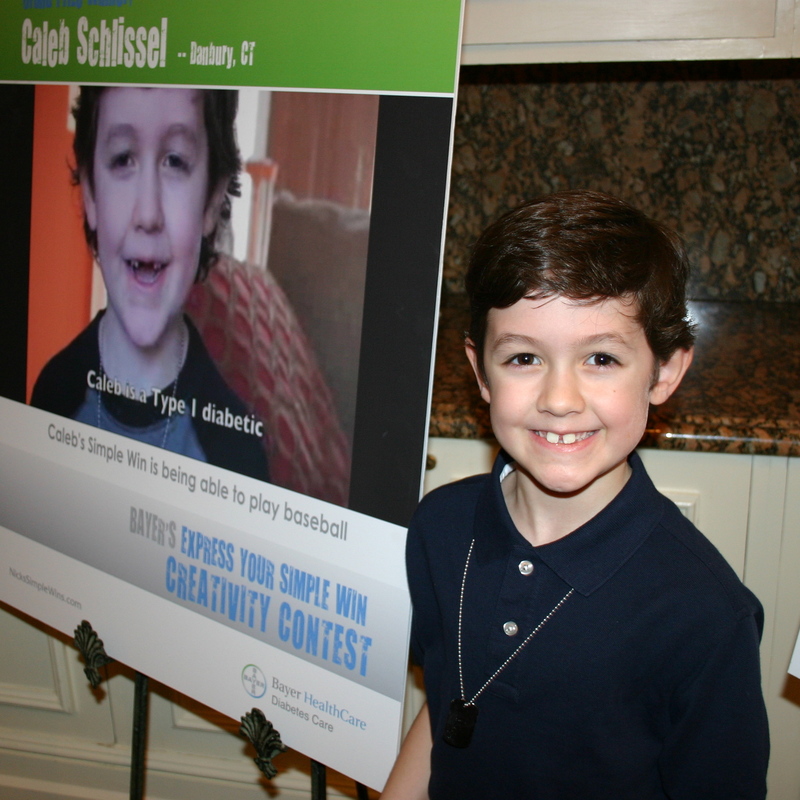 To view Caleb Schlissel’s winning video, log onto http://www.nickssimplewins.com. The Olympics Begin and We Root for Kris Freeman! Kris Freeman, cross-country skier, is competing with the US Ski Team in this year’s Olympic Games. He is a serious medal contender in all three cross-country skiing distance events. Kris has type 1 diabetes and like Caleb, uses the OmniPod insulin management system. We will be watching and rooting! Good luck Kris! To say that you are an inspiration is an understatement. I am simply in awe of you, your attitude and what you are able to accomplish. You have my utmost respect and then some. We first learned of Nick at our OmniPod training in April 2007. Caleb was diagnosed only months earlier and one of the things that provided me great comfort was learning about people living full, enriching lives with diabetes. I heard of everyday people – someone’s friend’s daughter or other patients of Caleb’s endo. There weren’t too many public figures living with diabetes that I found relatable. So when I heard of a young man who was diagnosed shortly before Caleb, using the same pump as Caleb, and was continuing with his career in the public eye, I was intrigued. Since then, Caleb has become a true Nick fan. He owns his music, has been to his concerts, and has various books, magazines and paraphernalia featuring Nick and his brothers. Caleb enjoys singing, plays the piano, is learning the guitar and recently acquired a set of drums which he practices daily – sound familiar? When I saw the tweet from Amy about Bayer’s Express Your Simple Win contest last spring, Caleb and I got to work. In October he found out he was one of three grand prize winners and would be meeting Nick in Orlando. Caleb, his brother Colin and I had the privilege of meeting Kevin, Joe and Nick at their concert in Bethel Woods in August 2008. It was a fantastic experience. We waited two hours to meet them for about 2 minutes. As soon as Nick heard that Caleb also has diabetes, his focus was 100% on Caleb. There were high fives, fist bumps, some words exchanged, a picture taken and huge smiles. Caleb’s reaction was priceless. He skipped out of there declaring, “that was totally worth the wait! !” I saw firsthand the real, tangible influence that Nick has. Two minutes was a thrill; I couldn’t imagine what an intimate meeting would be like. Upon checking in at the hotel, we heard, “Are you here for the Simple Wins contest? Is that Caleb?” It was Bradley, one of the other winners, and his mom. Caleb was so excited to meet them. That night, Caleb and I stepped out on the balcony of our room and heard, “Oh my goodness – is that Caleb? We’ve been looking for you all day!” It was Lauren, the other winner, with her mom and sister on the balcony next to us. Another great thrill. Meeting Bradley and Lauren was a prize in and of itself to Caleb. They were able to talk amongst themselves, whether about baseball, singing, helping the community, or about diabetes, and feel connected. There was an instant bond. On the day of the meet, the winners were brought to a grand conference room. Inside they chatted, took pictures and waited. First came Big Rob. He greeted everyone (or perhaps scoped out the room for Nick’s safety) and took pictures. Caleb was on top on the world. Rob left and while everyone talked about what fun that was, Nick nonchalantly entered. The first thing I remember him saying was to Caleb: “I know that YOU are a Yankees fan. You’re a good man.” I didn’t think it could get better than that moment. The four of them spoke of their interests, their stay in Orlando, the music they liked and they talked about diabetes too. He asked Caleb if he ever went low while he was playing baseball. It was nice. It was comfortable. It was exciting. They took some pictures, Nick autographed Caleb’s Burning Up book on the page where Nick talks about his diabetes (Caleb proudly declaring, “I read the whole thing”). Then they sat down and chatted some more. Caleb talked about the concerts he attended. Nick recalled being under the weather at one of them. They talked more about the Yankees and the World Series. Nick described how he watched the series on a laptop in Italy at six in the morning. Then “Bounce” became a topic of conversation and Caleb was invited to perform his version of Bog Rob’s “chicken wing” and “ham and cheese”. Big Rob came back in to watch. It was a reserved performance on Caleb’s part, but still great to see it bring smiles to everyone’s faces. I spoke with Nick’s father, another kind and gracious man. Upon thanking him, he responded, “we understand”. It’s true. They know. He explained that Nick does this because when he was diagnosed, he wanted to know of the athletes and musicians and other public figures who were living with diabetes. The list was short. Nick understands the comfort it brings, and his ability to provide it. So he does. I spoke to Nick. I took the chance to explain why what he does is important to us. Caleb doesn’t wonder if diabetes will limit him. He has virtually always had Nick as a point of reference to know that it won’t. I don’t think Caleb has yet to even consider if diabetes could be an obstacle to anything he wants to do. I credit Nick a great deal for giving that to him and I told him so. As things were wrapping up, Caleb mentioned to Nick that they used the same insulin pump. They took turns pulling up their shirts showing each other their Pods. I have never seen Caleb smile so big or for so long. Ever. Thank you Nick. Thank you Bayer. You have created meaningful, lifelong memories. The day itself was a thrill, but what I hope is that at least one day in Caleb’s future, when diabetes is proving difficult, he will think back to this meeting in Orlando. He will remember a young man that was not all that different from himself: a young gentleman, with a curl to his hair, a love of music, a charming smile and the same daily challenges to manage his blood sugar. I hope he will think of Nick and remember that diabetes didn’t slow him down and it doesn’t have to slow Caleb down either. Caleb with his prize as a finalist in Nick's Simple Wins contest - autographed picture of Nick Jonas. …and Caleb is one of the grand prize winners of Nick’s Simple Wins contest. The Grand Prize? Meeting Nick Jonas in Orlando!! We could not have done it without all of you who watched his video! Thank you so much!! In addition to our “offline” friends and family, our Facebook and Twitter friends came through with force and helped him win! Thank you for watching and posting and retweeting!! If you didn’t catch the contest video, you can watch it by clicking on the above link (he sounds so funny without his front teeth – a lot happens in six months!). Here’s the original version we did not submit because the rules strictly prohibited logo usage, but since we are in the middle of the World Series I thought it would be fun to include. And if you haven’t seen enough of Caleb (which I know you have – sorry) here’s another entry he did just because he’s a crazy nut. Caleb is very excited. Thank you for giving this gift to him. I have no doubt this will be an experience that he will treasure always.